Join us every Wednesday morning for a light breakfast and heavy networking, 7:30 a.m. to 9 a.m. Location: Gather in Downtown McKinney, 207 E. Virginia St., between Tennessee and Johnson streets. Bring $1 and plenty of business cards; no reservation necessary. Guests may visit two times as a non-member. Bring a Guest Contest – Drawing Every Quarter: Chamber members can win a gift certificate for bringing a guest. Each time you bring a guest throughout the month, you will get an entry into the drawing. Invite guests to join you in taking advantage of this valuable networking event, and you get the reward! 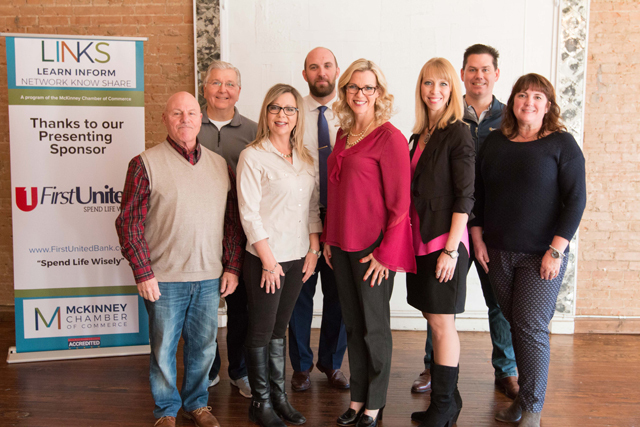 If you are interested in being a Breakfast Sponsor contact Karen Farris at 972-542-0163 or kfarris@mckinneychamber.com. Our LINKS Committee is made up of chamber member volunteers. Thank you for all that you do week after week to make this program a success.